Colourful, creative, cheerful. 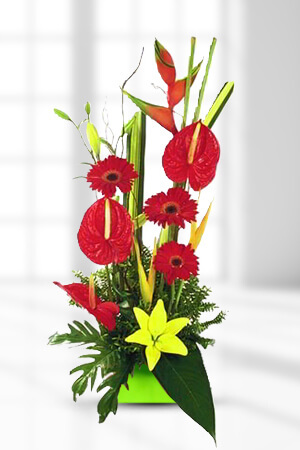 With such a bold, bright flower arrangement, you will decorate any space imaginable. Spread some cheer and send Carefree as a gift or order it for delivery to your home or office today. Lilies may be sent closed/partially closed in order to prevent damage and to last longer.To better personalise your gift, we recommend a bottle of Red Wine to leave a lasting impression. Very easy and user friendly website. The flowers were delivered as promised, and were beautiful, just as they were on the website. Will use again. It is the first time I have ordered flowers on the internet. I loved being able to see what the different arrangements and flowers looked like, though this did make my choice a little harder !! So many beautiful flowers to choose from. I was told that they arrived yesterday afternoon and look beautiful. The tracking service provided and the email received advising of the delivery is great so I can be assured the flowers have arrived. Very Happy.